One day when $34$ children were in class, Mrs Clifton, their teacher, said they were going to make some block graphs and other things using their first names. She put the class lists onto the white board. First, the class made tally charts of the initial letters of their names. They worked in pairs. Can you make a full tally chart using the class names? 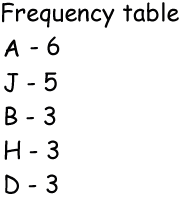 Next they all made frequency tables using this information. 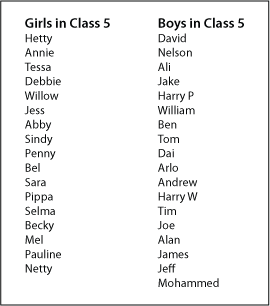 Can you make a frequency table using all the class's names? Next they decided which letters of the alphabet were needed and which were not needed to make a block graph of their class names. 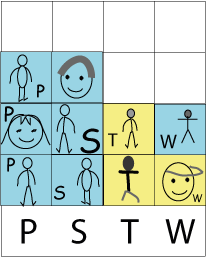 Then the boys took yellow squares and the girls took pale blue squares, drew a picture of themselves and put the initial of their first name on the square and stuck it onto paper to make a pictogram graph. Can you see who was away from school that day from this information? Next they made true block graphs from the class lists to include anyone who was away that day. Can you tell what letters these were? Can you make a block graph of all the class? STEM - physical world. Handling data. Investigations. Processing and representing data. Interpreting data. Experimental probability. STEM clubs. Frequency tables and Bar Charts. Comparing data. Collecting data.